We are experiencing triple digit temperatures (100ºF+) in Sacramento this week and it’s crazy staying outside. Seriously, just being out in the sun for 15 minutes to pick up my kids after their school bus drop off, I wanted to run back inside the house. I thought of using an umbrella to protect myself from the sun, like most Filipinos do in Philippines, but it felt odd doing that now. Since I got here, I haven’t seen anyone with an umbrella unless it’s raining. Anyway, when the weather’s like this, I prefer to stay indoors with A/C on and get comfortable, spend time on Facebook, or maybe read a book or two. Can’t really cook and bake much till after this heat wave is over. In order to beat the heat, frozen treats or ice cold beverages are very much welcome–ice pops, ice cream, iced coffee, ice candy, smoothies, milk shakes, etc. 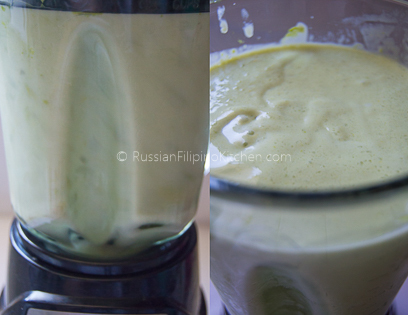 My kids and I were in the mood for some good milk shake today–fruit milkshakes to be exact. Good thing we stocked up on some fresh fruits this week, so it was convenient. I made melon shake for them and avocado milkshake for myself. We all agree that it was delicious and satisfying! 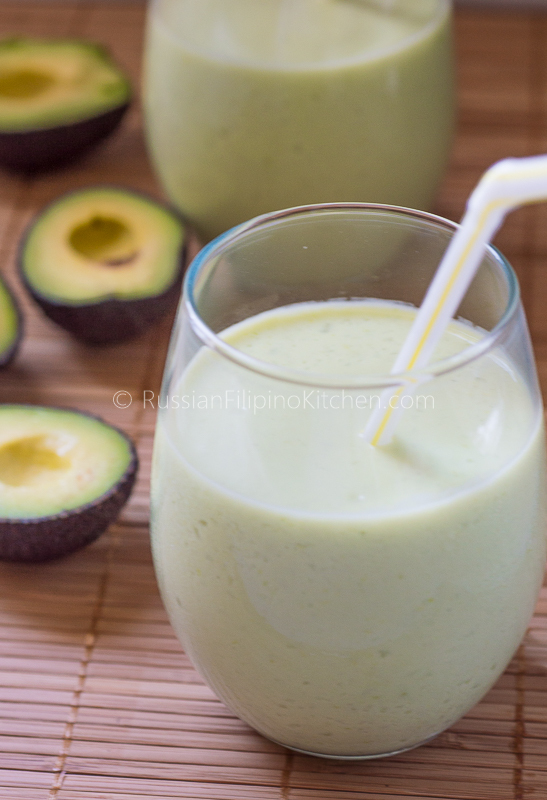 Today’s recipe is for Filipino-style avocado milkshake. It’s sweet, thick, creamy, and so easy to prepare. 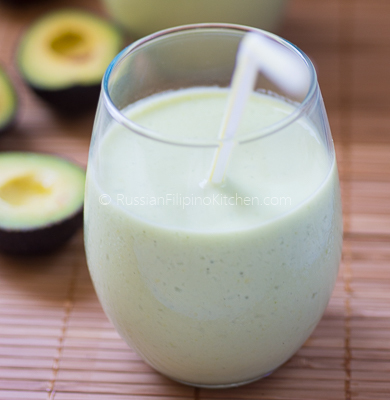 This is one good way of adding healthy fats into your diet since avocados are loaded with that. also called monounsaturated fats. You can substitute regular milk with skim milk, or even soy or almond milk. Also, feel free to reduce the sugar or substitute with other sweeteners according to your taste. This makes 4 servings of milkshake, 16-0z or 2 cups each. Enjoy! 1. 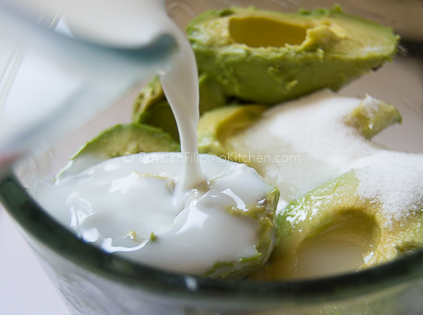 Cut up avocados in half, remove the seeds, and scoop out the flesh using a spoon. 2. 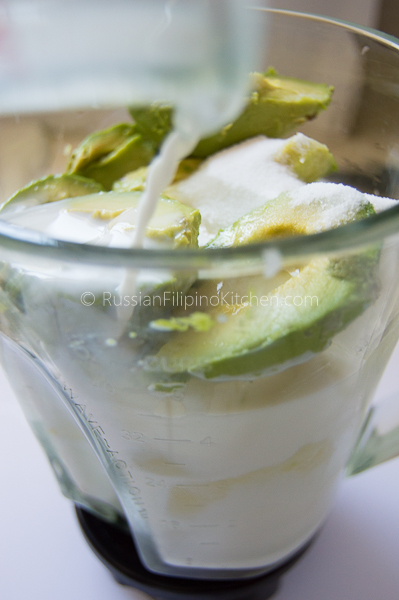 Place into the blender the ice cubes, sugar, avocados, and milk. 3. Pulse in blender for a few minutes until smooth. 4. Pour into individual glasses and serve. 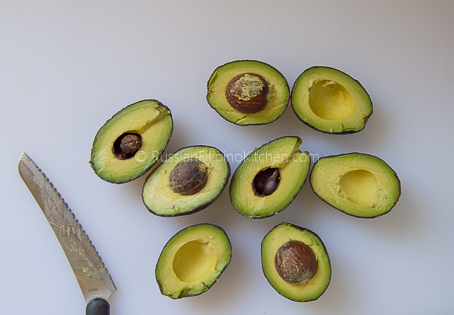 Cut up avocados in half, remove the seeds, and scoop out the flesh using a spoon. 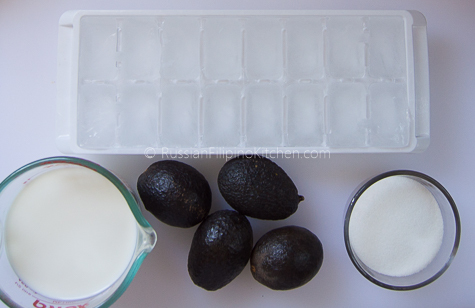 Place into the blender the ice cubes, sugar, avocados, and milk. Pulse in blender for a few minutes until smooth. Pour into individual glasses and serve. This looks cool and refreshing. We are eating sandwiches – living in the same area as you, I know what you mean about cooking and the heat. By the way, the only people I see with umbrellas when it’s hot are other Filipinos – usually brightly colored, flowery parasols. Stay cool. I live in Elk Grove, just down the road from you. Bet you shop at Sea Food City, don’t you? Oh my! Your comment went to my Spam box I just read it today. We are not that far. I only shop at Sea Food City when I need Filipino ingredients, otherwise I often go to SF Supermarket ‘cos it’s much closer to our house.